Ensuring that young people have the digital skills needed to join tomorrow's workforce must be a priority for both businesses and governments. Two thirds of children starting school today will take up jobs that don’t yet exist. This makes preparing them for the future a challenging task. How do we equip young people for lives that we can’t predict? Historically this has always been the task for the education sector – but we all have a role to play. For many organisations operating today this has meant greater investment in digital skills training, especially as 4.3m people in the UK still have no digital skills whatsoever despite 90% of new jobs requiring them. Yet the skills needed for the future are broader than just confidence with digital tools and processes. We need to prepare people for a life that will operate digitally, and all that comes with it. This involves changing mindset, systems, processes and practice. Such holistic transformation will include digital skills training, but also needs to address the variety of society-wide issues that are already stifling our progress. Issues to consider are numerous. There is the serious lack of diversity in the UK tech sector where just 17% of employees are female, and in STEM higher education where 69% of undergraduates are male. There is also a mismatch between supply and demand for newly qualified STEM students. Geek Talent has an alarming stat where 1,000 people studying courses related to computer games development or design in the North East had just 29 relevant roles open to them. 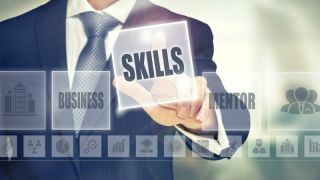 A positive take on this is that we will have an abundance of digitally capable graduates who can adapt and apply their new skills to other roles in the sector. But perhaps, in the first place, colleges and Universities should be offering courses that provide specific skills and engender development for specific roles where there is an industry need? What can we do to increase the appeal of these broader roles and uptake in STEM subjects among young people? We also need to better understand the impact of automation on future roles – approximately 20% of existing jobs in the UK are at risk. At the same time we must address accessibility and connectivity. Too many people in the UK still struggle to access the internet, living in rural areas with poor internet connectivity. And, according to the recent Lloyds Consumer Digital Index, people with a disability are four times more likely to not be online. Digital isolation will increasingly become a serious social issue as more aspects of professional and personal life rely on an internet connection. It’s easy to feel dwarfed by the task, but those of us keen to contribute and help provide solutions to the problems shouldn’t be put off. Nominet, as a profit with a purpose company responsible for the .UK internet infrastructure, has a long history of supporting initiatives that contribute to a vibrant digital future that is connected, inclusive and secure for all. We have supported hundreds of worthwhile tech-for-good projects, donating £45m to positively impact over 10m people since 2008. A focus for us is helping young people develop their digital skills, which we do by supporting the Prince’s Trust Online portal; working with the Micro:bit Foundation; and through the launch our own Nominet Digital Neighbourhood project. Each of these can help to advance digital skills for young people. Nominet Digital Neighbourhood is embarking on its third year of digital skills training with a difference. In various UK cities, the programme provides training and paid work experience to young people with digital skills but limited opportunities, and then connects them with local SMEs, to help them both prosper online. For the young people, not only does using their new skills in a professional environment help to cement the ideas and processes, they also gain experience to add to their CV which should help them secure paid work in the future. The arrangement also benefits the SMEs who often struggle with time and resource when it comes their digital presence, despite recognising the importance of online marketing and promotion. To date the programme has trained over 100 young people and helped over 70 SMEs; we’re hoping to double these numbers in 2018. In the great scheme of things, it’s a small project tackling a corner of the wider challenge, but to those involved it can make a real difference. It also fosters a sense of community. Efforts to create opportunities for interaction and support within a local area will help to ensure the digital future is not one of silos. The variety of benefits from a project like Nominet Digital Neighbourhood is heartening, and we hope this latest phase will further support the wider efforts towards digital transformation. The challenge of preparing for a digital future is vast, but this mustn’t dissuade us from acting on our enthusiasm. There is certainly an appetite for transformation and plenty of investment in digital skills training, not to mention acute awareness of the challenges and support for solutions. There are also Government interventions, such as the Digital Skills Partnership which we are also involved with at Nominet. This is a start, helping to create processes that should direct this new, holistic approach to digital transformation. Ultimately, however, we must accept that the challenge will keep evolving. The digital future will always be beyond our imagination and will certainly contain elements we can’t prepare for. Flexibility and adaptability are key, just as thinking small to support a bigger impact is never a wasted effort. If anything, the small changes could be the only way to meet an ever-transforming challenge and help pave the path to long-term success.